What is "shresto"? Shrimp and pesto, of course! This pizza is especially delicious with my whole wheat pizza crust recipe, but if you're short on time, you can always use a store bought crust. it on a large pizza pan sprayed with cooking spray. Spread pesto evenly over crust. Top with 1 and 1/2 cups mozzarella cheese. Use a spoon to place even dollops of the ricotta cheese on top of the mozzarella. Sprinkle the shrimp and tomato pieces evenly on top of the cheese. Sprinkle garlic salt on top of the shrimp and tomatoes. Sprinkle the remaining 1/2 cup of mozzarella cheese on top of the pizza. Sprinkle the Parmesan and Chipotle flakes evenly on top of everything. Bake in the oven for about 10 minutes or until the shrimp are pink, the cheese is golden, and the crust is slightly brown. Think outside the bread pan! 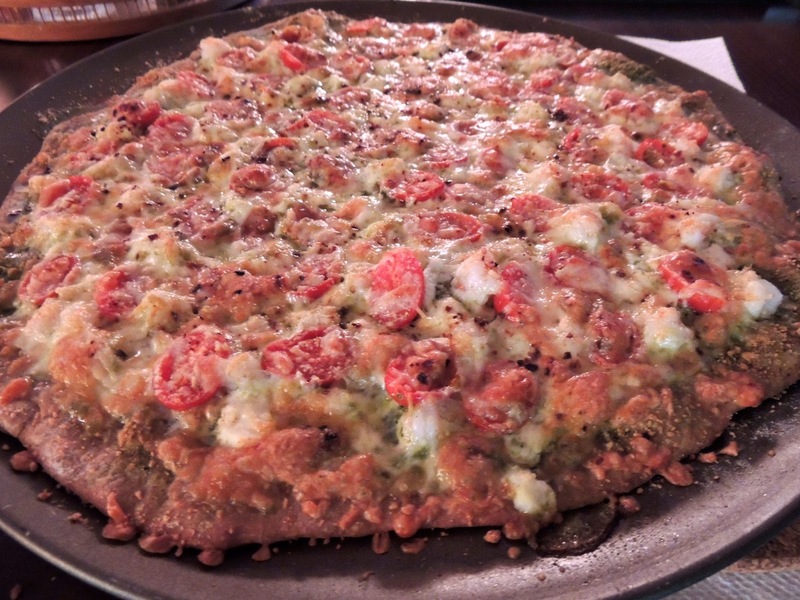 Meatloaf Chimichurri Pizza - recipe!